Logic analyzers use state analysis and timing analysis. They also can do state triggering. Ask the listeners: What is the craziest errata you’ve ever seen? 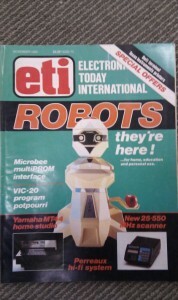 Dave went and picked up 100 kg of Electronics Australia magazines. Chris still gets tripped up by rules of thumb for the metric system. XKCD has a brilliant chart of different ways of remembering amounts. The CSIRO are trying out a new wireless data system that can transmit over 10 Gbps! They also are the rightful inventors of WiFi and receive royalty checks for people that use the standard. We don’t like companies that only defend patents (like Intellectual Ventures) but if they roll the money back into research, that’s ok! OSHW Association was announced recently. They will be a registered 501c3 corporation. Followup from the other week: The Raspberry Pi made it through EMC testing and will be manufactured and sold now. Andrew Back does a first look at a beta unit, connecting it up to a vintage CRT monitor. What other hobbies have home labs? Most chemists are afraid to have labs at home because they might be accused of devious behavior. Though they still have a ways to go, plastic electronics are getting lower impedance and are still printable. Molex has mini-fit crimp terminals that have a 1500 mating cycles at 13 amps! What are your connector design considerations? The Linear Technology LTC4366 (yes, LT again). It’s a chip that can detect and protect against incoming surges. It’s programmable for time and over voltages. Plus it can float on your rails! Cool! Got anything we’ve missed? Want to hear something different on The Amp Hour? Let us know in the comments! And be sure to subscribe to make sure you’re getting the latest episodes right when they’re released! 10 Mbps? Thats like so yesterday. There is something wrong with the MP3 download link. When I click it, I get a file, which looks like php source code instead! That ABC doc isn’t viewable outside Oz – anyone have a link to a copy? Sorry, I can’t download the mp3, it just points to a php source file. In this and other shows Dave mentions “Improvised electronic devices” as an established term for something the security authorities are worried about. I have never heard this elsewhere and Google mostly seems to find pages about a Front Line Assembly album with this name. Could it be that this is a mix-up with the term “Improvised explosive devices” (IEDs)? Airport security e.g. might worry about electronic circuitry being part of an improvised explosive device and might want to investigate further, but I doubt they will refuse people from traveling with some circuit boards as long as they are just not connected to explosives. Am I wrong? Is security staff really banning electronics from everywhere or is it just that Dave happened to misinterpret the abbreviation IED as referring to improvised electronic devices rather than to improvised explosive devices? ETI loved it. In the UK it was around (to the best of my knowledge) until the mid ninety’s or so the disappeared. Had every edition for over ten years until her indoors called enough and they went to the tip. Just wonder how how much they would be worth now? Looking forward to seeing them again great idea but make sure you are not infringing an copyright by using their content, isn’t it like music (licence wise)? Would love to see that format return, even Elektor is a poor substitute in comparison. Uneducated retards in position of authority = where we are now. just google “Toronto’s G20 hacker”. Hobby rockets = jail time. Rasz: Crazy. And not good. Still, is “improvized electronic device” an established term? I just listened to this audiobook and really enjoyed it. There is a fair amount of information about player pianos and how ideas from the player piano provided one possible implementation for switching control frequencies of a radio guided torpedo – WWII era. cool stuff. I wish you had expressed a little more skepticism of CSIRO’s patent claims. Although it’s not one of the hated software patents, the claims in the ’069 are quite broad. Intel requested ex parte reexamination at the USPTO and 15 of the original 72 claims were struck as part of the reexamination process. Considering that the CSIRO beat the likes of Microsoft, HP, Intel, Dell, Toshiba and others *combined*, to me shows that there must have been some validity to the patent. And they settled too, which means they knew they were going to lose. And these are not companies that just settle willy-nilly. Just because big companies settle does not mean that a patent is any good. These companies are all part of the broken patent system, and are so stuck in it that they are not interested in getting rid of it. The one who pays the bill is the small companies and the consumer. Just because big companies settle does not mean that a patent is any good. Maybe not, but these big companies have an infinite amount of money and legal resources, and they usually do not settle unless they are pretty darn certain they are going to lose the case. Their modus-operandi in patent suits is usually never to settle, just keep throwing money and the best lawyers at it and stalling, until the smaller company goes bankrupt. Surge suppression… A DEF Stan spec for vehicle 24vdc supplied equipment includes a load dump test which applies 100vdc with 0.55 ohm source impedance for 50ms. You would need more than 50 SMC package tranzorbs in parallel to clamp that to 43v. You need a series element to either shut down (if acceptable) or regulate through the surge. You precede that with higher voltage tranzorbs and/or some capacitance to protect the series element from high voltage low energy spikes. The LTC4366 looks interesting. I would be more excited if it included a charge pump and level translator to drive an N channel MOSFET. Not plastic but details of how to make Negative Resistance devices from catwisker + zinc oxide at http://www.sparkbangbuzz.com/els/zincosc-el.htm. Might be of use for printable semiconductors? Whoa, awesome. I’ve been saying this kind of thing for months now. It gives a catalog feel to the regular dk interface. A bit buggy and not for full time use, but greasemonkey makes it easy to turn on an off at will. Works really well on connectors, especially if you can narrow down your search to 250 or less parts(the arbitrary limit of picture display in this version). Make sure you search “in stock” to get full effect. Weird confluence of events. I recommended EEVBlog to some guys on the MITX server (MIT’s experiment in open college courses) and I figured I’d go back to some of Daves early Vblogs. Guess what I came across? Dave’s first VBlog talks about the patten suit of 802.11! Same thing you’re talking about today. Dave, you’ve come a long way. Yes, it was indeed news that day I shot my first ever blog. Seems like so long ago! Weren’t you gonna post a link to a fully potted PCB in clear acrylic or something? Sounds nice.